On July 1st, 2012 the Federal Government introduced a carbon tax of $23 per tonne of carbon dioxide emitted to air from certain industrial sites and this will incrementally increase by 2.5% per annum. It was intended to apply this tax to the 500 highest CO2 emitters. For an overview of the plan, refer to the Clean Energy Future website. The Treasury website also provides information on the economic modelling of the carbon price in graphical format. Although the Government's Carbon Tax has targetted the 500 worst emitters, the remainder of industry, small to medium sized businesses and domestic users will be affected by the flow on effect in the form of increased electricity and gas surcharges. Information received to date suggests that electricity providers are passing on all of this carbon dioxide equivalent to industrial and domestic consumers. With regard to carbon dioxide emissions from the combustion of natural gas, it should be noted this combustion occurs on industrial and domestic sites, not on the premises on the gas provider. Very few of these sites fall into the "500 worst emitters" category. In spite of this, the tax has been applied to the gas providers and passed on to their clients. 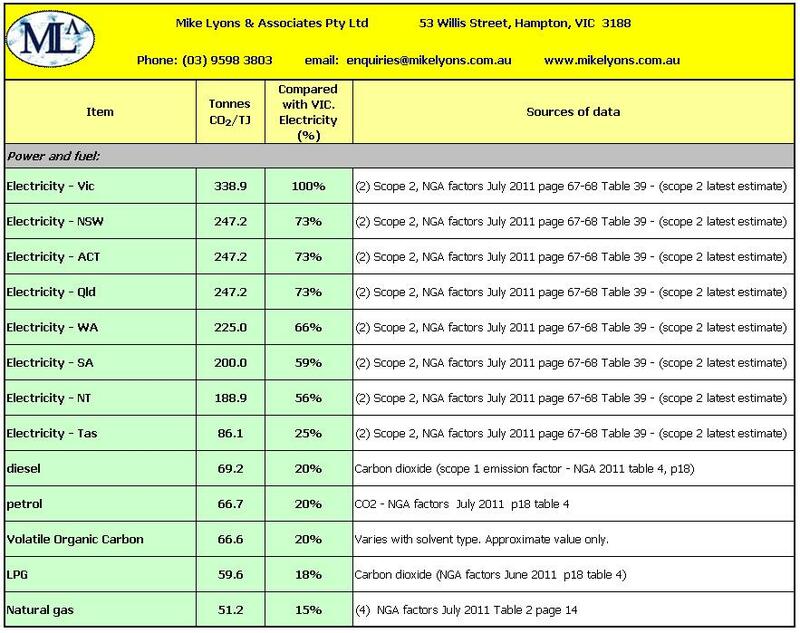 The above table shows the equivalent CO2 emission per TJ (Terajoule) of energy. It is interesting to note that one TJ of electrical energy can be up to six times greater in equivalent CO2 emission than one TJ of natural gas. The final comparison needs to be made on the basis of the cost of one TJ of energy from the various sources. There is a wide variation in potential carbon tax on electrical energy between the States, the highest being Victoria at $7858/TJ compared with $2044/TJ in Tasmania. This will vary between States and will vary with the size of your organisation. For further assistance with this calculation, email us.